Khenpo Sonam Topgyal Rinpoche is the senior Khenpo of Riwoche Monastery and founder of the Riwoche Society and Temple in Toronto, Canada. 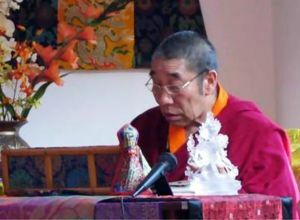 He is also an Honorary Khenpo of Katog Monastery in Tibet, and a senior holder of the of the Nying Tig and Ter Sar lineages from Nyoshul Khen Rinpoche, Chadral Rinpoche, Dudjom Rinpoche, and others. He holds the experiential lineage of the Long Chen Nying Tig teachings as well.